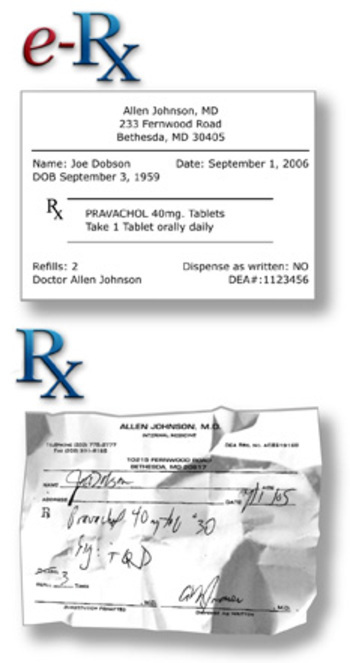 From a pharmacy perspective in healthcare, one of the more elusive solutions has been e-prescribing (or eRx). There are numerous companies (e.g., Allscripts, Prematics, Purkinje, RxNT, Zixcorp, iScribe) that have solutions and many more that have died over the years. When I was at Express Scripts, we funded RxHub which was an industry solution by the PBMs (Pharmacy Benefit Management companies) to facilitate eligibility checks and other electronic transactions. Some of the managed care companies have spent millions rolling out these solutions. In general, most of them are adopted as interesting tools and then disgarded by MDs at the first sign of trouble. Honestly, there is very little in it for them unless they have a quality bonus. Physicians are one step removed from the filling of the Rx. They care about patient safety, but it is hard to change their working habits. So, I wondered the other day whether BPM could solve the problem. Doctors all use some type of system for managing their office. This ranges from simple systems that just capture data to much more involved PPMS (Physician Practice Management Systems) or EMR (Electronic Medical Record) systems. Then either route it back to the MD for questions or send it to the patient’s pharmacy of choice. An interesting spin on this would be to do an auction at the end where pharmacies could bid on the prescription (e.g., BidForRx). Patients could create customized rules in the BPMS solution that processes the claims and managed the auction based on their interests. Just a thought. This seems to make adoption easier (no change in process); deployment cheaper (no ongoing support); integration cheaper and easier; and add additional value (patient involvement).